It had seemed a delightful afternoon for a backyard barbecue on Saturday, July 8, but at 6:07 p.m. Woodstock neighbors heard what they described as an explosion, behind the home at 5505 S.E. 42nd Avenue. Portland Fire & Rescue firefighters had been fighting a small grass fire below the bluff overlooking Oaks Bottom earlier, which had required dispatchers to redistribute units in order also to fight this fire. Not long after the call went out, Lents Station Engine 9's crew arrived, and reported back seeing heavy smoke coming from the back of the house, and from the roof vents as well. While the initial "size-up" was being called in, Woodstock Station Engine 25's firefighters also pulled up; followed by four additional crews – one of them from University Park Station 4 on the west side of the Willamette River. 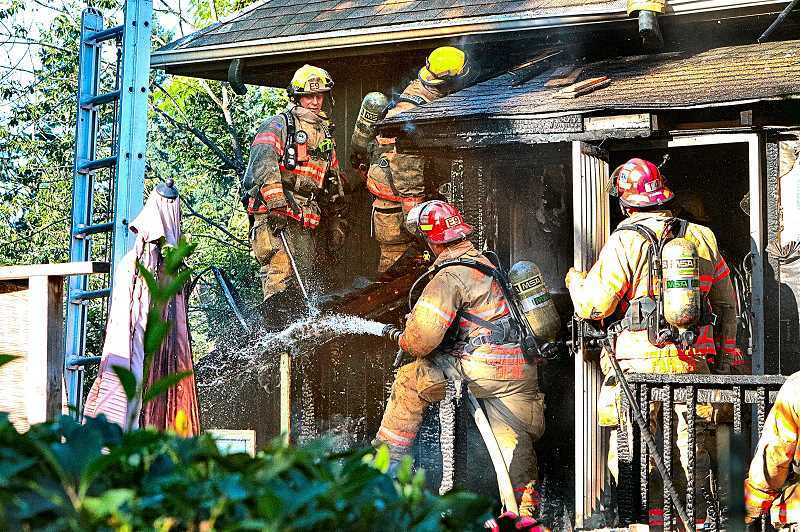 Heading around back, the firefighters found that a barbecue grill had "flamed out", exploding into a blaze on the rear wooden deck of the home, singeing the siding and roof eaves of the house. By 6:30 p.m. the crews had put the fire out, and were focused on wetting down the areas of the house that had been exposed to the flames. "People should make sure their barbecue grills – especially gas-fired ones – are cleaned, before they are used – every time," advised a firefighter heading back to his rig. A damage estimate has not been made public by fire investigators.